ASRock had taken an early lead in serving the mini-PC market, thanks to its Vision / Core series units. Based on motherboards meant for the notebook market (smaller than mini-ITX, but larger than pico-ITX), they have been regularly refreshed since the ION days. Over the last couple of years, mini-PCs in the ultra-compact form factor (UCFF) - tagged as NUCs after being made popular by the Intel Next Unit of Computing systems - have emerged as one of the bright spots in the troubled PC market. Strangely, ASRock didn't have any play in this UCFF NUC form-factor. That changes with the arrival of Intel's Cherry Trail based on 14nm Braswell. The ASRock Beebox is a NUC based on the Intel Celeron N3xxx, and carries some unique features that include fanless operation, a USB Type-C port in the front panel and support for up to three simultaneous display (including 4K ones). The ASRock Beebox is available with either the Celeron N3000 or the Celeron N3105 as the internal SoC. Each of these units can come either barebones (i.e, no internal storage or memory) or, as a ready-to-go system (with or without the OS). ASRock supplied us with the following reference pricing sheet for the N3000 series. For a $20 premium, the increase in the internal storage from 32GB to 128GB is quite welcome. Both memory slots get occupied (and 4 GB of RAM is appropriate for the system's use-cases in the intended target market - digital signage, embedded applications and industrial usage). Note that only the N3000 series is fanless. The N3150 series uses active cooling. 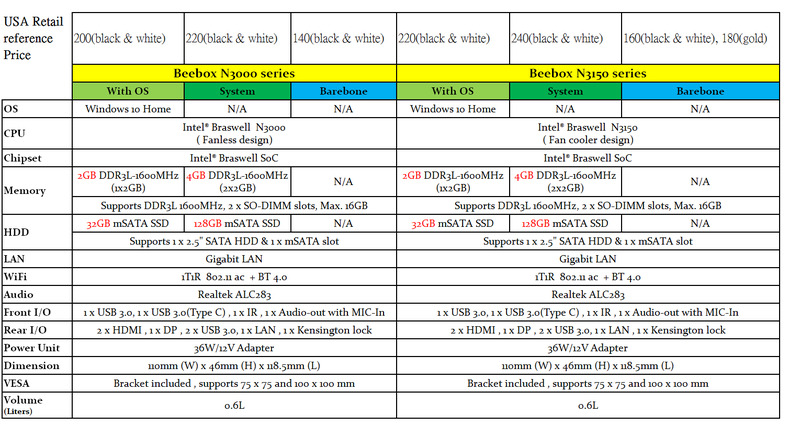 The specifications of our ASRock Beebox N3000-NUC review configuration are summarized in the table below. The ASRock Beebox N3000-NUC kit doesn't come with any pre-installed OS, but does come with a CD containing Windows drivers. In any case, we ended up installing the latest drivers downloaded off ASRock's product support page. In addition to the main unit, the other components of the package include a 36 W (12V @ 3A) adapter with a replaceable US power connector, a VESA mount (along with the necessary screws), a driver CD, user's manual and a quick-start guide. In addition, we also have the appropriate cables - both data and power - to install a 2.5" drive in the system. A small IR remote control with a pre-installed CR232 battery is also part of the package. The gallery below takes us around the hardware in the unit. One of the interesting aspects shown in the gallery above is the chassis and motherboard design to accommodate a 2.5" drive with the SATA port and the power pins to the right of the SO-DIMM slots. The other aspect is the maximum possible memory in the system. Even though Intel's official specs indicate a maximum memory size of only 8 GB, we were able to install 2x 8GB panram P8D3L1600C116G2VS sticks for a total of 16 GB of RAM. These operate with the same latencies as that of the pre-installed sticks - no benchmark improvements were found with the panram sticks, but there was a slight increase in the power consumption. So, we retained the pre-installed DRAM kit for our benchmarking purposes. In the table below, we have an overview of the various systems that we are comparing the ASRock Beebox N3000-NUC against. Note that they may not belong to the same market segment, but all of them are fanless units. The relevant configuration details of the machines are provided so that readers have an understanding of why some benchmark numbers are skewed for or against the ASRock Beebox N3000-NUC when we come to those sections.